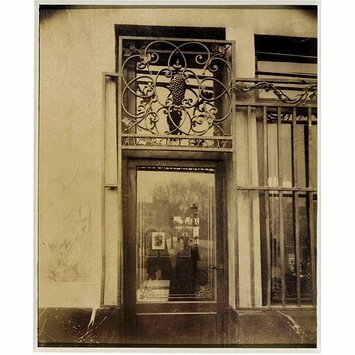 This photograph is an albumen print, contact printed by Atget from a 24x18 glass negative. The dark shapes of two clips which held the negative in place on the right edge of the image are visible. This image was one of many photographs bought by the V&A directly from Atget, in this case, in 1903. 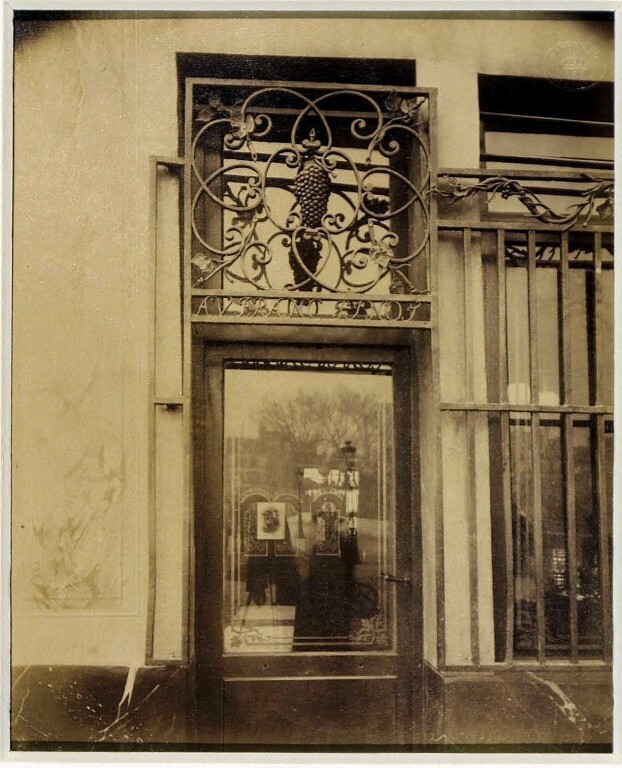 This photograph would have been bought as simply an illustration of ironwork in Paris. The albumen process was almost never used by the early 1900s, so the image can be dated to the 19th century. The use of this developing process also supports the non-art status intended for the photograph. There is, however, an ambiguity in the reading of this image and most strongly in the reflection in the door of the street and Atget with his camera. This is one of a number of Atget images where it is possible to see why his photographs have fascinated 20th-century photographers; it carries, whether intended or not, a strangeness which invests the image with potential meaning beyond its primarily documentary role. Photograph of a shop front and door, with iron grilles over the windows. A ghostly reflection of the photographer is visible in the door pane.